Do you have questions about your finances? Topics like personal budgeting, credit ratings, credit card debt, and identity theft may not be exciting topics for many individuals, but they can have profound and sometimes lasting impacts. 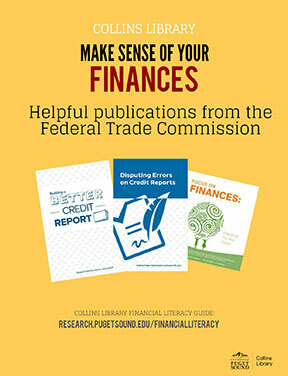 To help inform students about these topics, Collins Library will be adding educational materials created by the Federal Trade Commission to our Life Skills Collection that’s located in the library’s Learning Commons. The materials cover a broad range of financial topics, and are free to take home and keep. We hope these materials will serve as a useful addition to our existing Financial Literacy resources.